Sometimes, you just want to sit back and enjoy a video game without being pushed to your limits. Not every game has to challenge your endurance, your patience and problem solving skills. I always felt like Kirby fits that relaxing game category, with straight forward but varied game design that lets you sit back and just experience joy. If you’re an adult looking at the cute, pink ball of Kirby and thinking it’s for kids, you wouldn’t exactly be wrong, but you’d be missing out on something quite special. 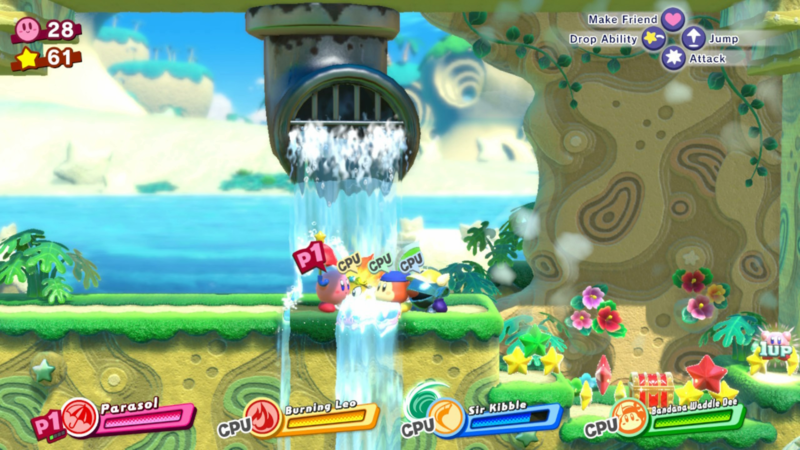 Like most Kirby games before it, Kirby Star Allies has a unique mechanic used in various areas. This time around it’s the friend mechanic. This mechanic isn’t as immediately exciting as some from past games, like a robot suit or seeds that turn you into a giant pink behemoth, but it’s much better integrated into the DNA of the game than those were. It all starts with gathering friends by throwing hearts on enemies with abilities to turn them to your side. 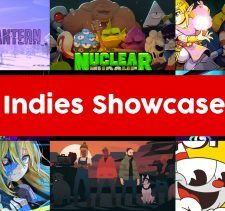 You can then mix and match elements with weapons, to give a wider gamut of options to fight with — a fire sword, electric bombs, curling rocks or just pick up and chuck your friends around the level. Part of the fun is experimenting with what works with which ability, with plenty of surprises throughout the entire game! The options with friends don’t stop there, though, with plenty of sections of the game combining a full party into a context specific abilities that use all 4 characters. A lot of these abilities fill the gap of a few missing copy abilities, like a giant wheel in place of the actual Wheel ability from previous games. There are still a lot of unique application of these friend abilities, and they’re definitely in there to keep all the characters together during faster paced sections. Boss battles also come back, with both new and old faces. Each world typical has one or two (sometimes more) big boss fights, each with their own play style and even elemental properties. On top of the boss fights, you’ll encounter plenty of mid-stage bosses, and screens that play like a horde mode, fighting off groups of weaker enemies. 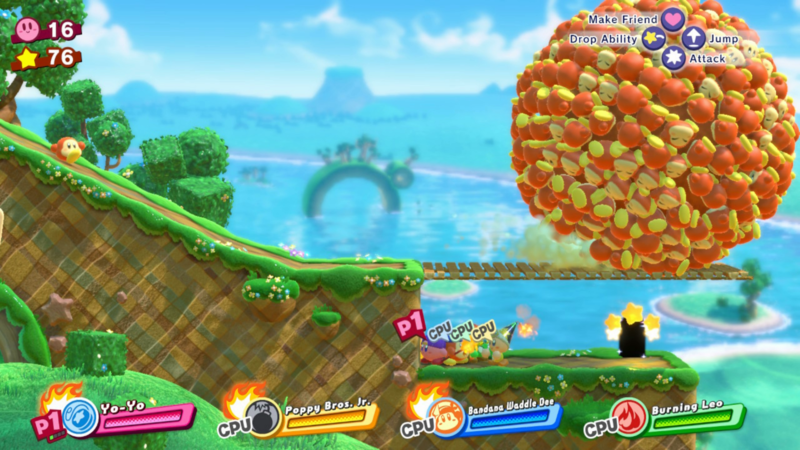 Level design in Kirby games have always had to walk a particular line, with copy abilities being a core part of the game, but not a core part of basic progression. 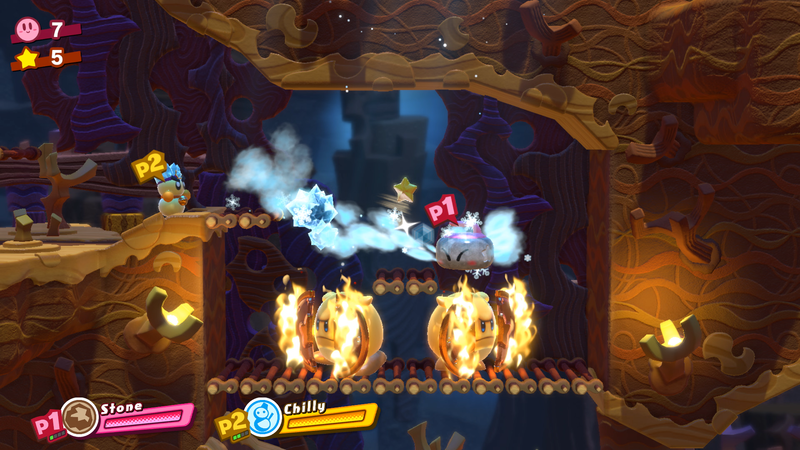 There are some puzzles that need specific abilities to solve, like fire to light fuses for bombs and cannons. 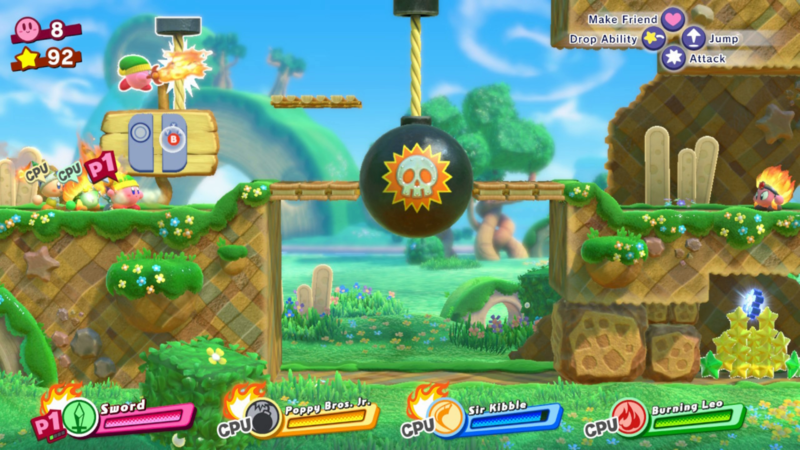 With Star Allies introducing mixing abilities, a lot of puzzles may require specific powers on specific weapons, adding another layer of complexity to standard Kirby puzzles. Thankfully, most of the time those needed abilities are nearby or right in the puzzle itself. 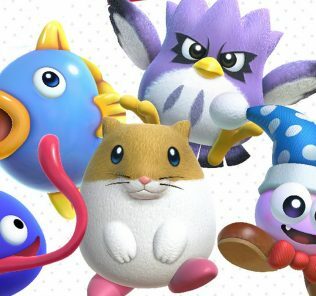 Star Allies is more or less just more Kirby. Which, in my opinion, is a really good thing. The friend mechanic make co-op a fun party game experience, but with clearer objectives. There’s not much challenge to be found, which is sort of refreshing. 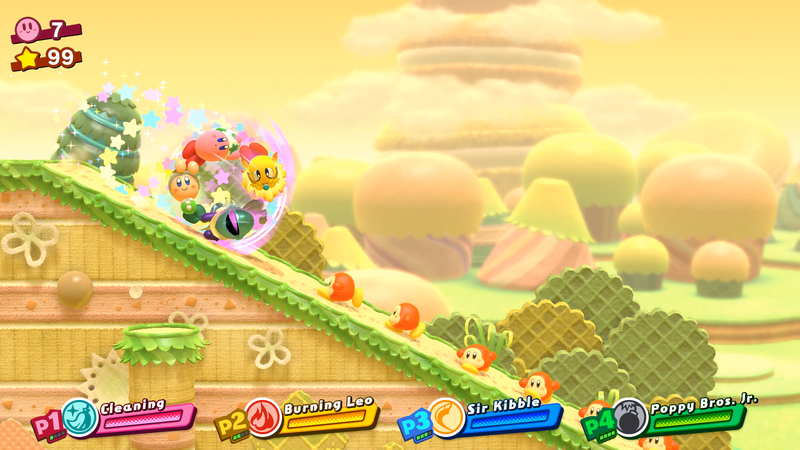 Kirby games are a bit more of a passive experience, with Star Allies having a bigger sandbox to play with. The main story of the game isn’t incredibly long, but is chock full of great content. Each level does actually feel quite distinct from the next, with the exception maybe being around the middle of the game. Each level has plenty of secrets and collectables, and even hidden switches to unlock bonus levels. In typical Kirby fashion, none of these secrets are terribly hard to find- they actually feel easier to find in this game than previous games. I quite liked not having to stress about checking every nook and cranny, and having a play style free of distraction. 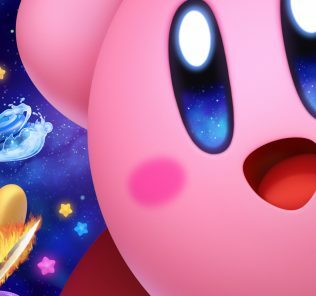 And so much about Kirby Star Allies feels like a love letter to the entire Kirby franchise. There’s plenty of homages and references to older games and characters, including certain abilities bringing in classic cameos. 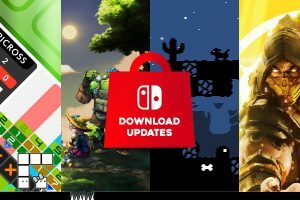 But the biggest callback in Star Allies are the collectable puzzle pieces. 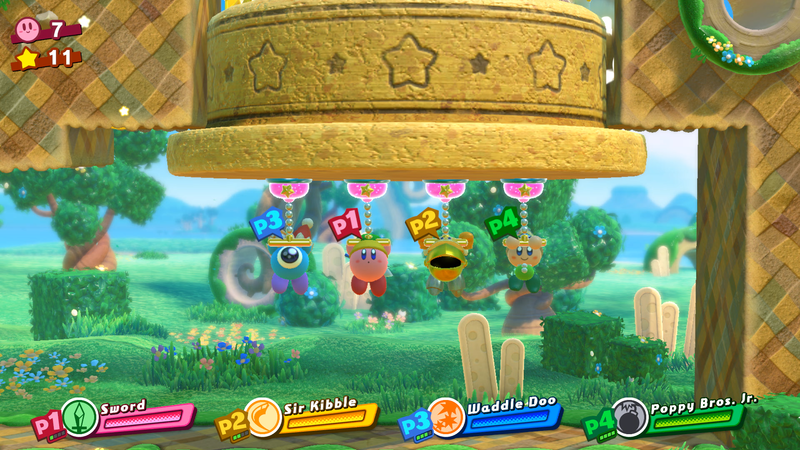 Much like Streetpass Puzzles, these pieces are found in smaller challenges within levels, and come together to make unique artworks representing previous Kirby titles. There are a handful of other great surprises for long time Kirby fans, which are better left to find and experience yourself! Within all the friend making, there is one niggly issue I have — the AI aren’t 100% smart enough to know what you want from them. Holding up on the left joystick will give the AI friends a clue that you want them to do something. This could be combining an element with a weapon, or a variety of other context sensitive actions. Sometimes you can have all the AI go through every single combination of abilities before you get the one you need, like spawning health items. Quite often with the Rock ability, trying to get a water or ice friend to activate my curling ability would result in them activating it from the wrong side. And then the few dozen times my AI friends would fly into enemies with no intent to attack, or get crushed by moving blocks. 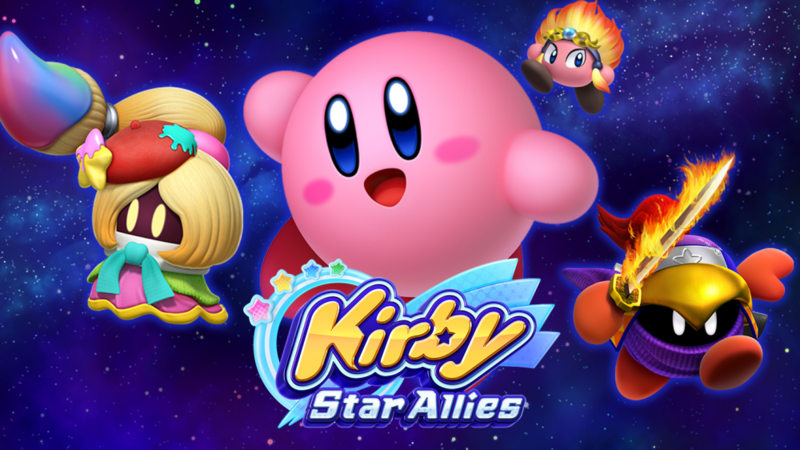 While Rainbow Paintbrush came out on Wii U, Star Allies is the first non-spin off Kirby game in HD in the history of the series. The extra detail doesn’t go to waste, with one of the cleanest art directions on the Switch so far. All of the detail comes at a slight cost, with the game seemingly running at 30 frames per second. Since Kirby isn’t a fast paced game, the sub-60 frame rate is forgivable, but I’m not quite sure why a game with simple aesthetics is taking that hit. And the last thing I want to talk about, is the music of Star Allies. Kirby has very iconic themes that are brought back with each instalment, and this entry is no exception. What took me by surprise, however, is how great the newer pieces were. And even more so were new songs that felt like reinterpretations of classic Kirby tracks. As soon as I’m able, I will be listening to this soundtrack over and over while writing in the future! When each Kirby game is so different, it’s hard to call any of them “the best Kirby game ever” by any objective measure. 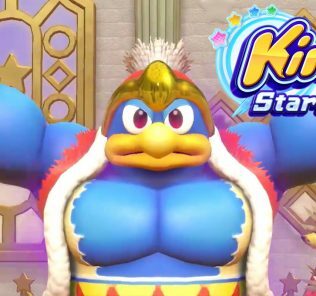 But Kirby Star Allies is a celebration of everything Kirby, delivering a solid and dynamic platforming homage to one of Nintendo’s star characters. Better yet, experiencing it with one or more friends is a special experience.